Hatches abound in the Newtown Pentacle. Often, these iron discs will be the oldest thing present on any given street, due to their durability and the difficulty one encounters when attempting to replace one. 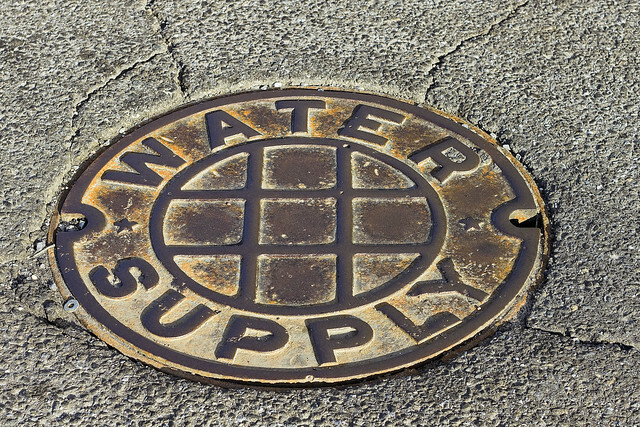 According to several Federal Highway and Street design manuals which I’ve suffered through – guidelines state that it is preferential to replace one of these hatch covers only with an exact copy issued by the original manufacturer. That’s probably why you’ll notice the Citizens Water Supply Company of Newtown’s hatches sprinkled around the neighborhoods of the Newtown Pentacle. 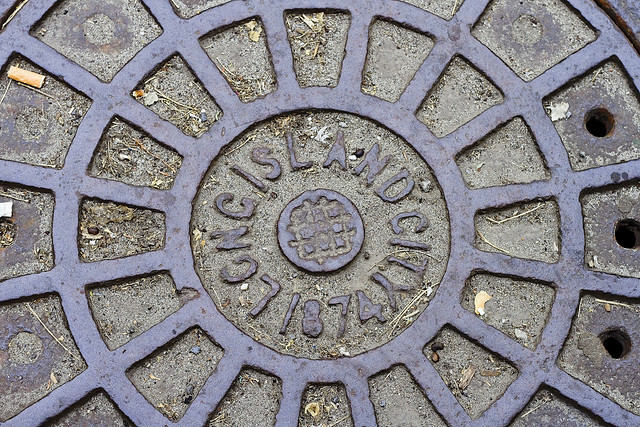 About a block from the 108th Precinct’s HQ in LIC, sharp eyes will notice this 1874 vintage (independent municipality of) Long Island City sewer cap adorning the pavement. Nothing else which has survived gentrification on this particular block dates back to anything earlier than 1900 or so, which makes this discus a genuine artifact of another age and a somewhat prehistoric culture. A few blocks away, on Second Street in LIC, there used to be an iconic power plant that (positively) electrified the Long Island Railroad. The power plant is gone, transmogrified by the Real Estate Industrial Complex into yet another bland residential building sheathed in mirror glass. The rectangular LIRR access cover remains, nevertheless. This chunk of iron likely dates back to the late 1890’s, an educated based on logo usage and operational era. 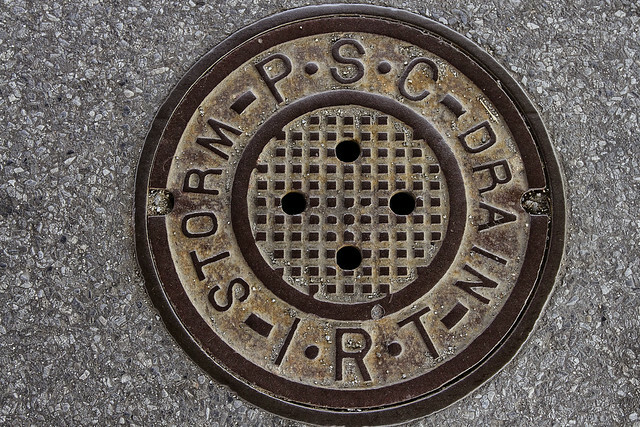 Over on Queens Blvd., in the Sunnyside area, you might notice these IRT branded storm drain covers. They are found on the roadway parking lots which underlie the massive concrete acqueduct which carries the Subway tracks high above. These access covers are a non standard size, btw, only around 16-18 inches across. They carry the sort of typography one would expect from the house of Moses at the TBTA, and I suspect that they might have installed when Queens Blvd. was widened to its current footprint back in the 1930’s (may have been 40’s but I think it was the post Triborough Bridge era in the late 30’s. Don’t trust me on this one, I’m pulling this from memory rather than proper fact checking). Once upon a time, there was just one phone company. 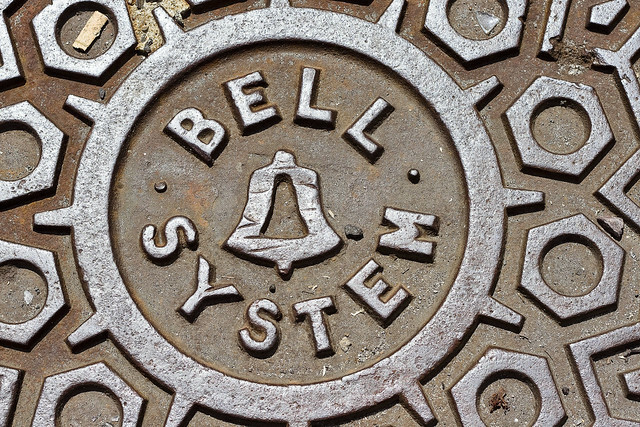 A monolith corporation which enjoyed a special status in NYC, the populace hereabouts called it “Ma Bell.” One of the interesting bits of history about which these access caps can inform the observer concerns corporate America. You’ll see “NYCTEL” and “Bell System” as well as “NYNEX” and “Verizon” sprinkled around here and there, and all speak to the roll out of telephonic infrastructure across the megalopolis, and the evolution of the telecommunications industry. Speaking of wires, Consolidated Edison caps are probably the most numerous hatch covers encountered. They are larger than most of the other ones, and are sometimes several feet in diameter. My understanding is that the electric people have been retrofitting their access pipes in recent years with plastic undercaps, whose purpose is to keep salt laden melt water from winter snowfalls from infiltrating down into and degrading the electrical equipment found within. 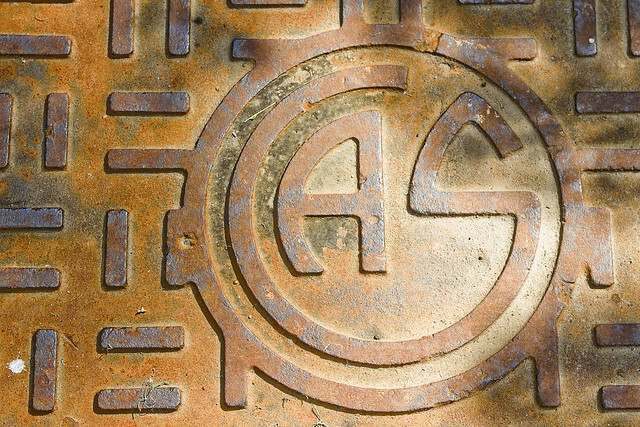 The hidden barrier also serves to vouchsafe against the manhole cover becoming electrified. Over in East Elmhurst, this gorgeous hatch was recently encountered along Ditmars Blvd. in the 80’s. 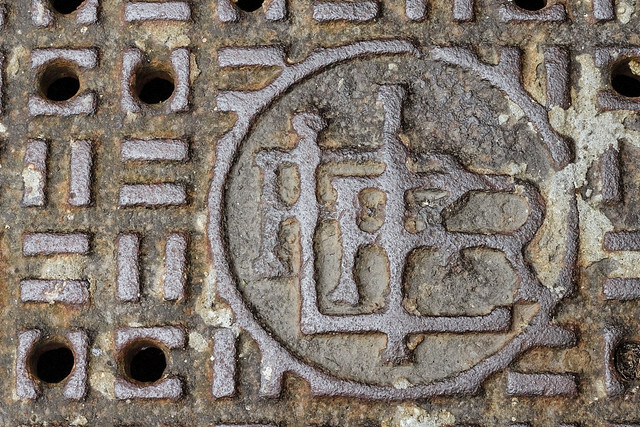 It belongs, or belonged, to the Brooklyn Union Gas Company – another monolithic organization which enjoyed – like the Bell System – a special monopoly in NYC. These mega corporations operated under the aegis of a “Public Utility” designation, which meant that in return for exclusive access to the NYC market they would agree to charging politically regulated rates and perform tasks in concert with municipal officialdom. The typography on this hatch is particularly pleasing, to my eye, at least. 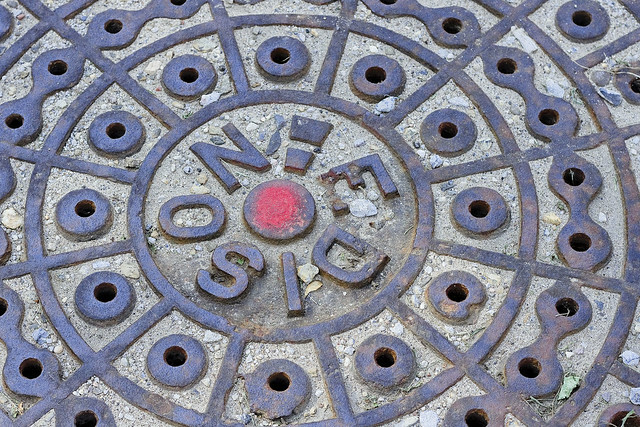 Also in East Elhurmst, around a block or two from LaGuardia Airport, this manhole cover was encountered. Signage nearby adjures that a buried gas line is in the ground, which might offer some clue as to the occupation of the hatch, but the “ACQ” screed embossed in the iron is somewhat puzzling. Any ideas as to its meaning, Lords and Ladies? 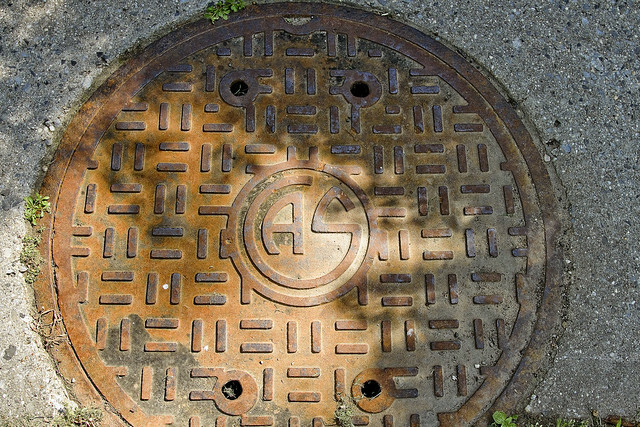 Hexagons on a manhole cover usually mean a communications/telcom company. 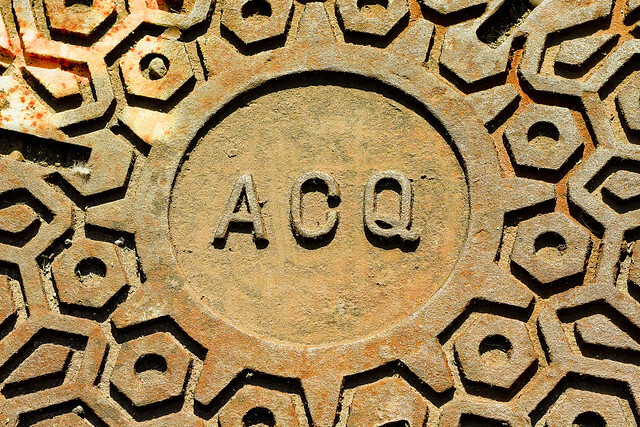 No idea about ACQ, tho. In the mid-1980’s when franchise cable TV originally came to our section of Queens (Astoria – Long Island City – Woodside -&- Jackson Heights) it was known as “American Cable of Queens” (ACQ). As I remember, under the City franchise regulations at the time, ACQ was designed to be a local operator. After a few years as an “independent” cable provider it was captured by Time-Warner. We’ve been suffering the consequences ever since.